CAM3 is an international non-profit organization that arranges street basket tournaments and urban cultural events for kids in Denmark and the Middle East in order to integrate minority youth in the community. In 2007 GAM3 became official NBA Cares Community Partner. 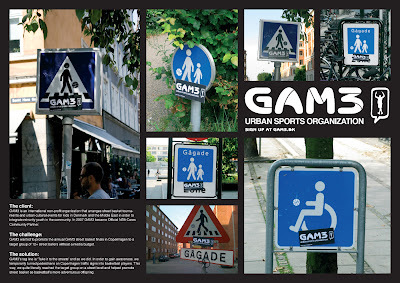 GAM3 wanted to promote the annual GAM3 basket finals in Copenhagen to a target group of 12+ street ballers without a media budget. GAM3's tag line is "Take it to the streets" and so they did. In order to gain awareness, they temporarily turned pedestrians on Copenhagen traffic signs into basketball players. This way, they quitte literally reached the target group on the street level and helped promote street basket as basketball's more adventurous offspring.